CIOs and other IT leaders are aware that they need to do more to enhance data center efficiencies. A recent survey of 124 IT executives and managers shed light on their needs and objectives as they relate to data center efficiency and automation. This paper highlights key findings from the survey. 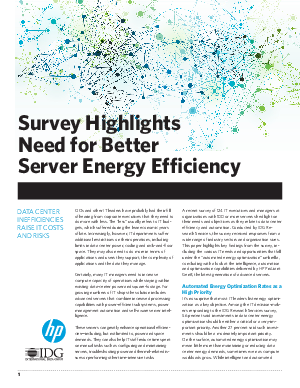 Find out how the survey highlights the need for better server energy efficiency.